The birth of baby Adolai makes Tre a big brother. 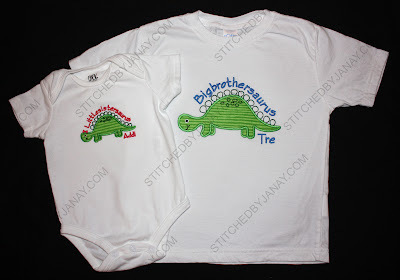 Tre loves dinosaurs, so when Karen posted a BigBrothersaurus shirt on her blog, I just knew I had to do something similar for Tre. AND since I didn't get it done before Adolai arrived (I'm going to blame that on her early arrival and not my poor planning), I decided to make a sibling set! 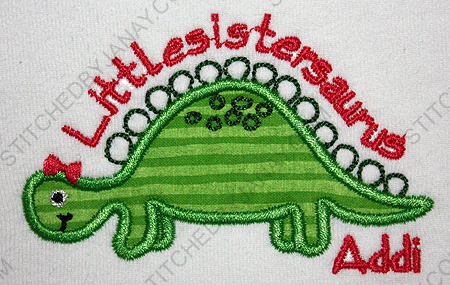 The applique dinosaur (#3) design is from Lynnie Pinnie. I used the 5x7 size for Tre. You know what took just as long as getting the text curved just right?? Finding the perfect-sized little bow to put on the 4x4 dinosaur to make it a bit more girly! :) I borrowed it from LP's 4x4 cheerleader. 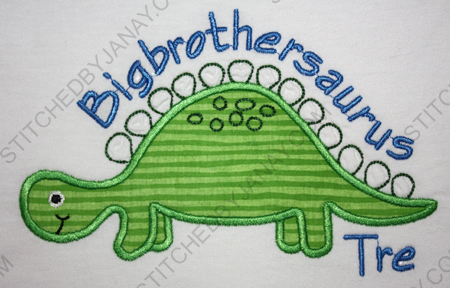 Ok, so not the most feminine little sister shirt ever, but I think Bigbrothersaurus will like it, and that's what matters. Well, I hope he doesn't mind that I used a potential nickname ("Adolai" just didn't fit as neatly as "Tre"). He uses his sister's first AND middle name, and is offended when his parents simply call her Adolai. Isn't that sweet?! To compensate, here's a girly burp cloth. 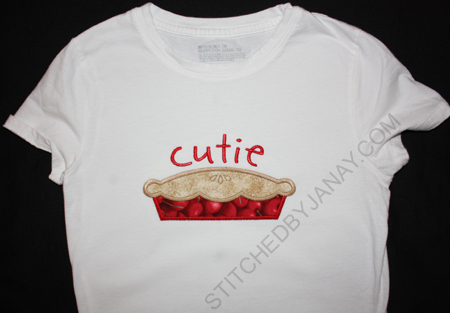 :) I used Lynnie Pinnie's Applique Swirl font for the "A" and added Adolai with Swirley from 8 Claws and a Paw. 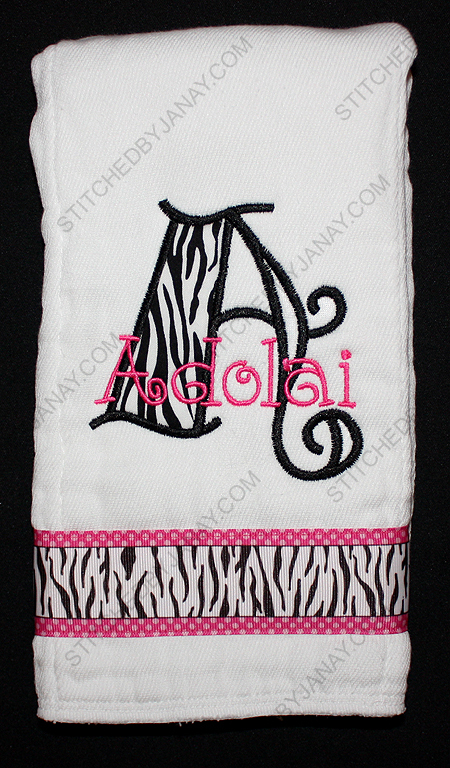 Love this zebra print ribbon! 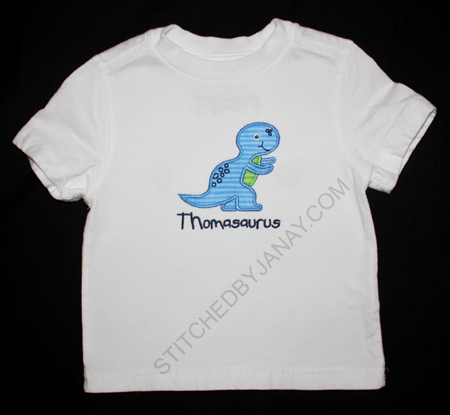 Amy contacted me about making her daughter's first birthday shirt. 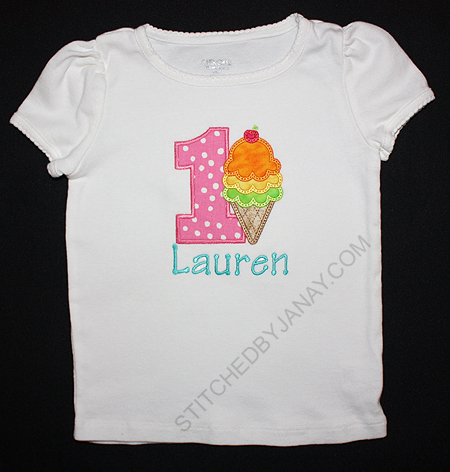 She already had a vision, so once I tracked down the right ice cream cone design, it was straightforward to put together! 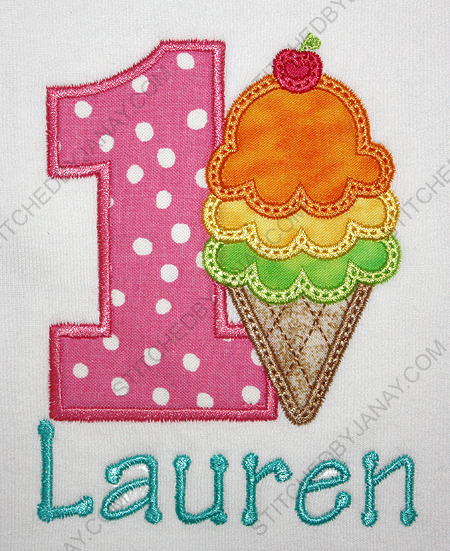 The "1" is from GG Designs' Chubby Wubby Numbers. 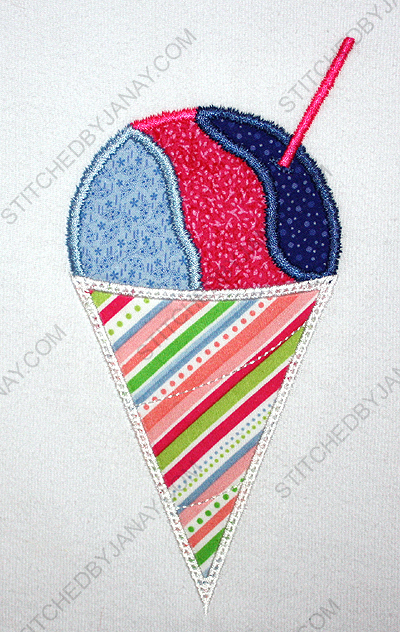 The triple scoop ice cream cone is from DigiStitches. 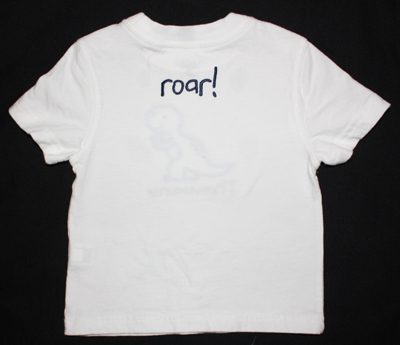 I added "Lauren" with the Tinker Toy Font from 8 Claws and a Paw. Even though Amy is in Colorado and I'm in Florida, we were able to work as a team to get this shirt to match the party decor perfectly... She mailed me a napkin from the tableware she already purchased and I picked fabrics/threads to match! Cool, huh? 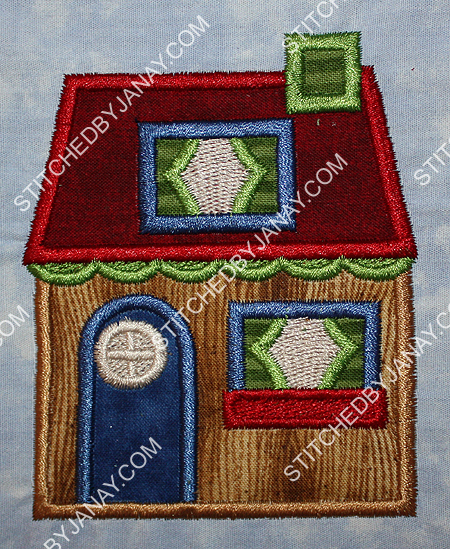 I had the opportunity to test stitch this cute little Cottage House applique design from Lynnie Pinnie, so I decided to create a little in-hoop wall hanging for myself. 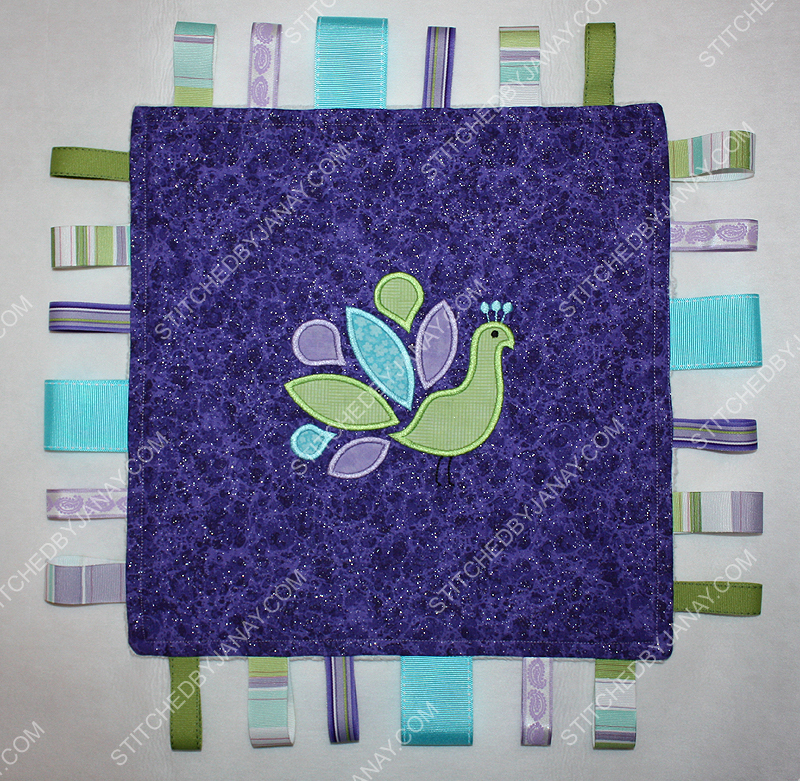 The bigger sizes have even more applique pieces. I think it would be so cute in fun whimsical fabrics, maybe on a larger wall hanging for a quilt shop? Wouldn't that be adorable?? 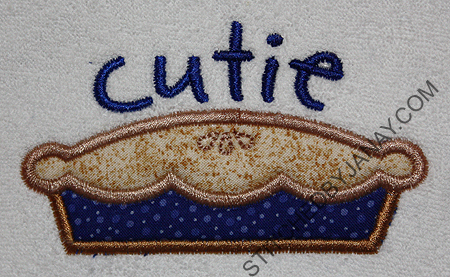 Lynnie Pinnie has a new design that I think is so adorable I had to stitch it twice! 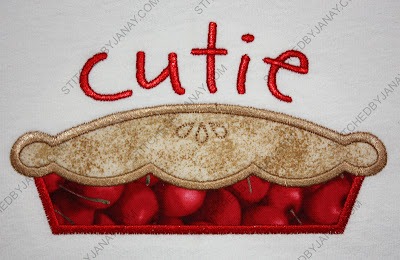 What a cute way to showcase this scrap of cherry fabric! I put the smallest size on this little bib. Thought I'd give blue a whirl. 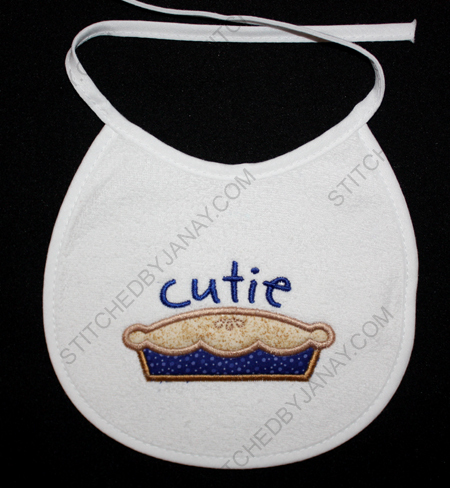 A cute blueberry pie... but is it too cutesy for a boy? What do you think? Mmmmmmmm... now I'm hungry for pie! 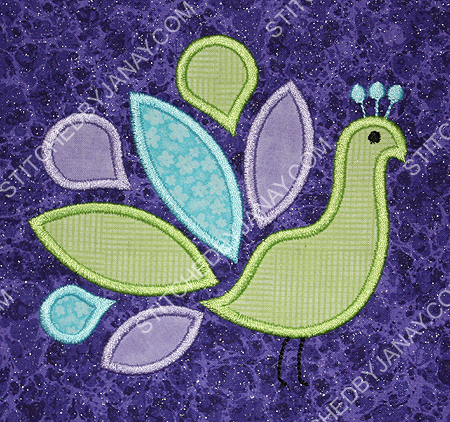 I knew immediately I wanted to use Lynnie Pinnie's applique peacock design. I picked a sparkly marble purple fabric for the front side. 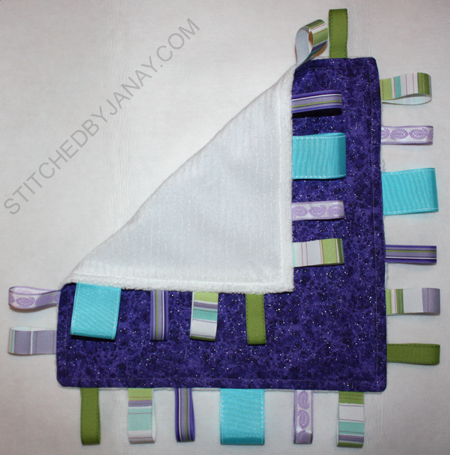 I used the vertical stripe ribbon as my color palette and selected fabrics, ribbon and thread to match. 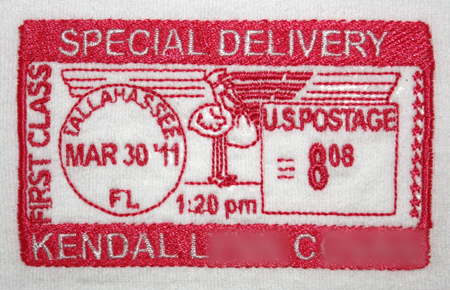 Then I used white minkee on the back. It should be a very special lovey! 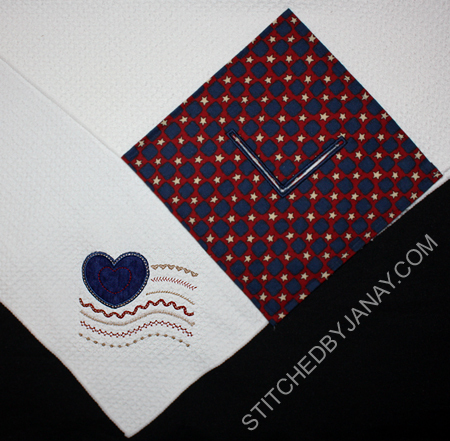 This week I had the pleasure to stitch a couple of Lynnie Pinnie's new patriotic designs. 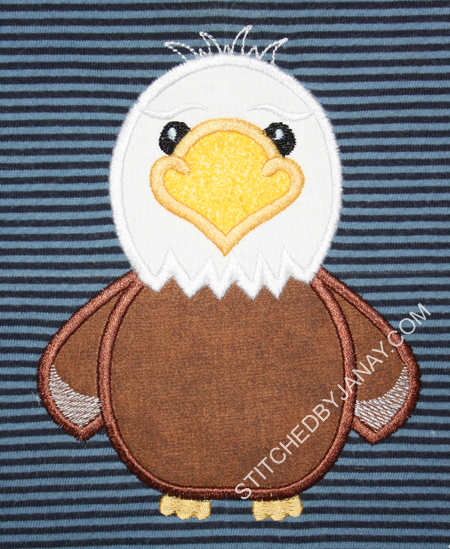 First, this adorable little applique Bald Eagle. 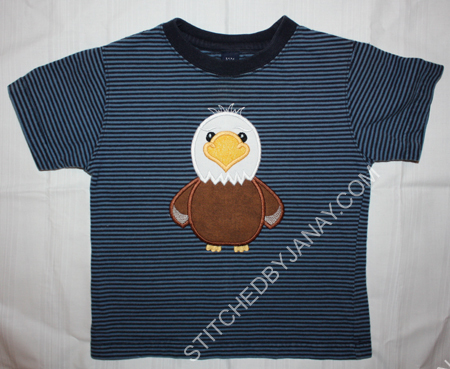 I put it on a shirt for Dashiell. He LOVES it. He hasn't stopped screeching or flapping his arms since he put it on. I don't think he'll stand still long enough for me to take a picture, so check out a little video of him that I posted on Facebook. 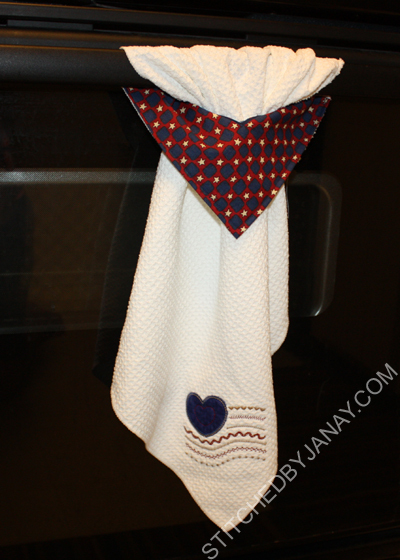 Next I made myself another stay-put towel (You can read more about my first one here). 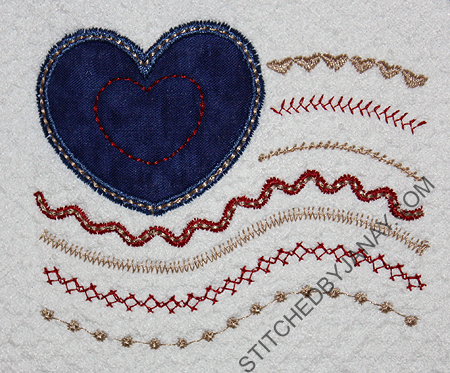 I used the Mixed Stripes Heart Flag Applique. It doesn't take a marketing expert to know how important a brand is for companies that sell products or provide services. However, just because I know it's important doesn't mean I have what it takes to create one! I'll leave that to the pros. 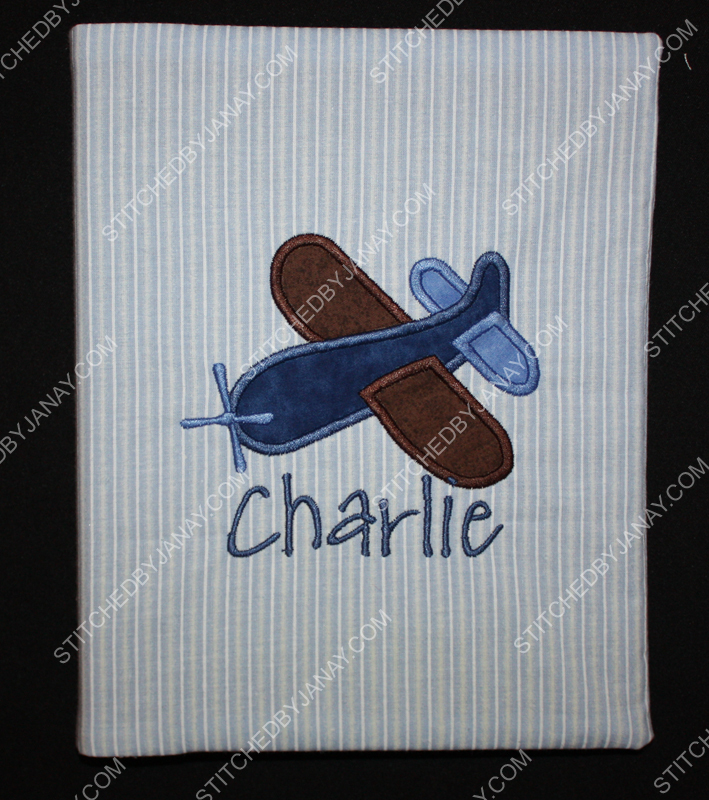 Ahhhhh... it's a recipe for an excellent embroidery design!! I spent all of my sewing last weekend adding the brand to shirts and jacket for the girls at Onyx. 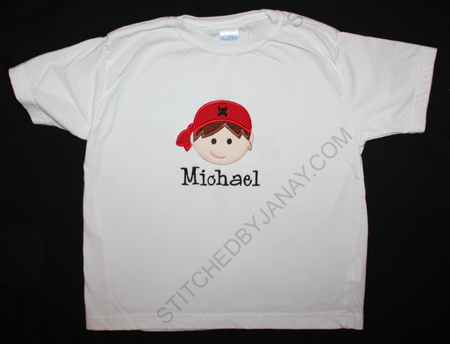 Each item also has the dot on the back below the collar line (like on these shirts). Annaliese has been begging for some tank tops for these hot Florida days, so when I saw these at Target for $3 I couldn't walk pass them without picking up a couple. 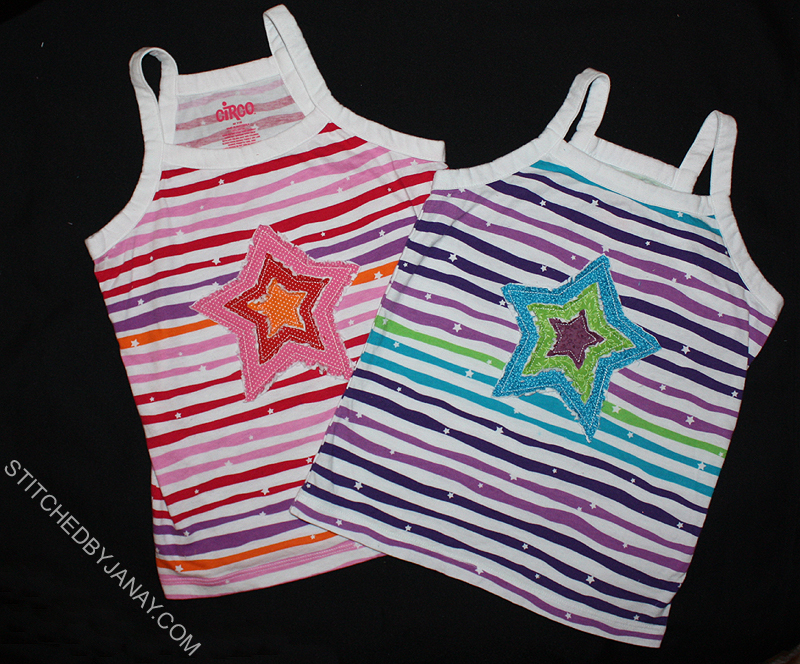 They sat waiting for some fun embellishment to come along, and inspiration struck yesterday! 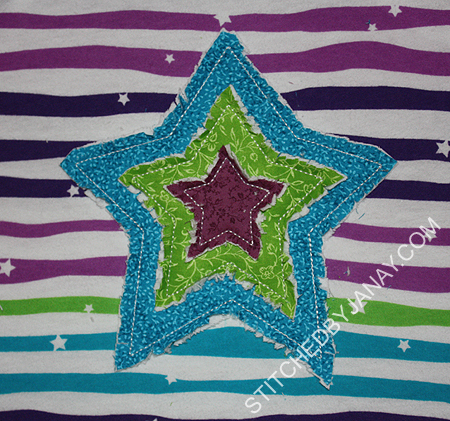 I really figured I would end up just slapping an applique monogram on these since the colorful stripe would be a busy background for an intricate design, but over the weekend Applique Market posted this free raggy star design. Since the tanks have tiny white stars scattered about, I thought it was perfect. 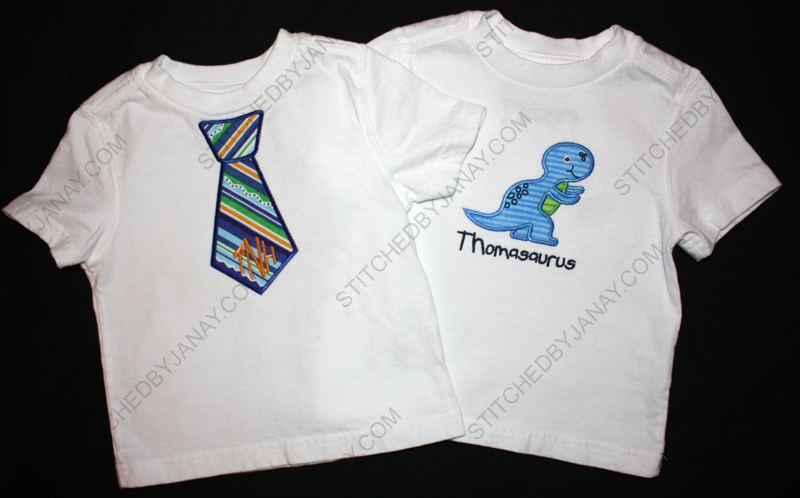 Annaliese and I sat down with my fabric stash and picked three fabrics for each shirt. I put a layer of white flannel under each fabric and stitched away. 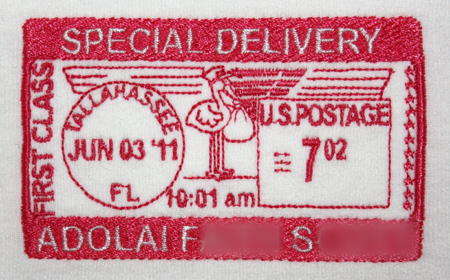 MAN these are lightning fast in the embroidery machine. Trimming and fraying takes the most time. 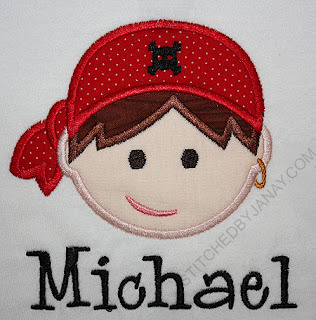 The Pirate Boy Applique design is from Planet Applique. I used Whoa Nelly from 8 Claws and a Paw to add his name. 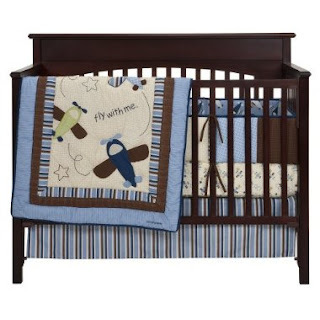 When I looked over her registry, I thought the bedding set she picked was adorable and tried to coordinate. Last Saturday *I* made a very special delivery. 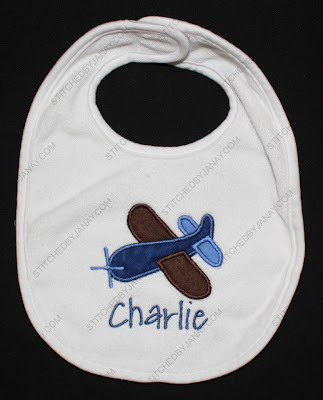 I visited a newborn baby in the hospital and gave her a Special Delivery onesie! I don't make hospital deliveries anymore (with two kids and a lengthy to-do list I don't really have the time) BUT in this case I just had to. 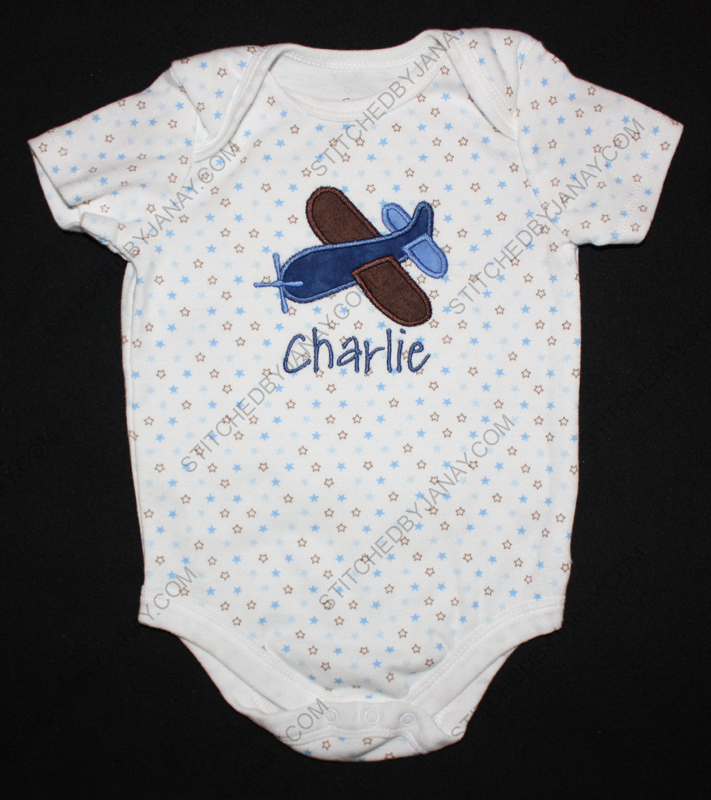 You see, little Adolai's big brother Tre was the very first recipient of a Special Delivery onesie from me! 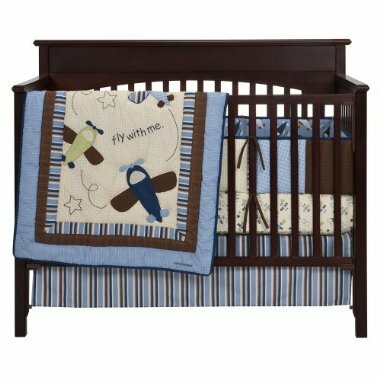 It's crazy... when Tre was born I debated whether or not to spend the money to buy that design. 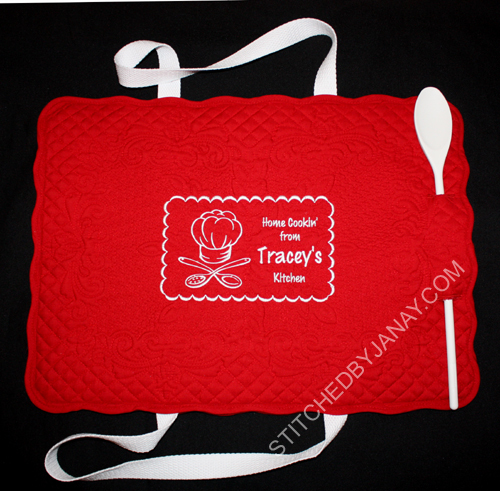 Sixty-seven stitchouts later... it's my most popular item! I'm so glad I did! Ok, since I've posted pictures of 67 of these, I think I'm going to stop blogging about them (maybe I'll make a big deal about #100). 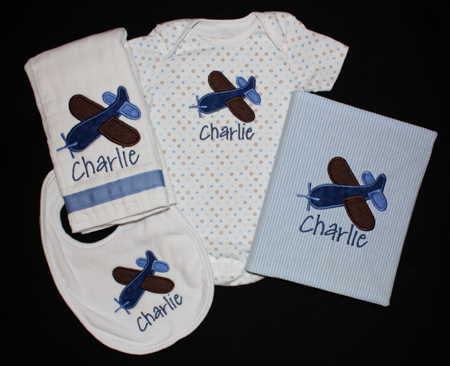 But I will continue to add them to my Special Delivery photo album on Facebook. 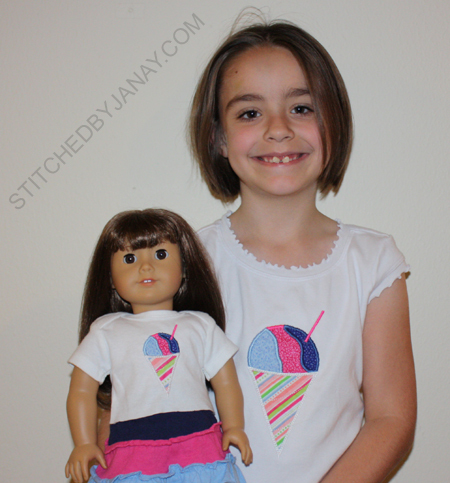 A couple months ago while shopping Annaliese picked a "Dolly and Me" outfit set to purchase. To be honest, it wasn't my first choice, but it was on sale, and it was her birthday money, so I let her get what she wanted. 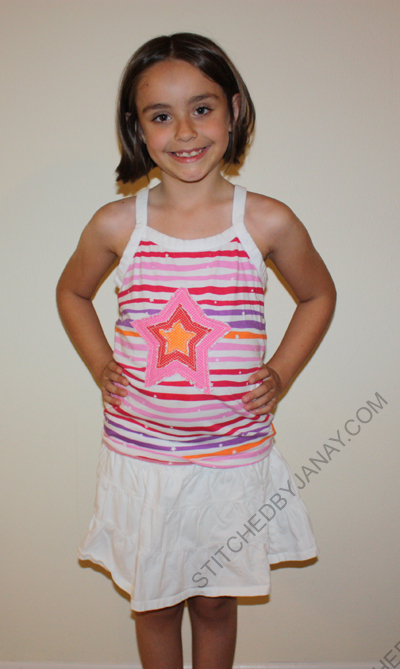 :) The skirts in the set are cute, I just wasn't thrilled with the tops that came with them. 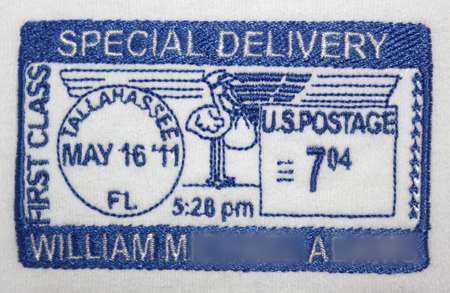 Fast forward to a few weeks ago when I received a package from Whimsical Designs -- a set of shirts that I won from a Facebook contest. Most of the shirts are bigger sizes to save for the future, but the white one fits Annaliese right now. When I saw the lettuce edges it made me think of her three-tiered skirt, and I started brainstorming design ideas. We considered a 3-scoop ice cream cone, a striped Popsicle, but agreed it just had to be this adorable snow cone! Perfect for summer! 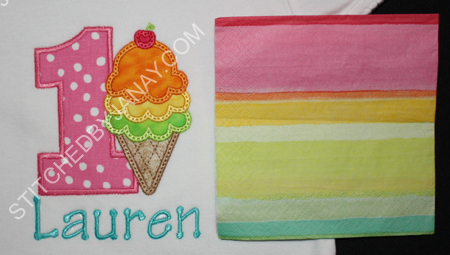 The Rainbow Snow Cone design is from Lynnie Pinnie. All these fabrics were in my stash! 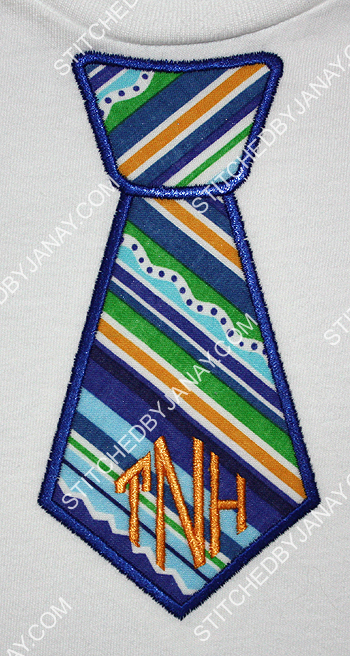 The stripe isn't quite perfect, I'd love to swap out that lime for a dark blue. But I'm sure if I hit every fabric store in town I wouldn't find anything better! I used the 5x7 size on Annaliese's shirt, and I reduced the 4x4 design to 80% for the doll shirt (which is just a cut-off newborn onesie). 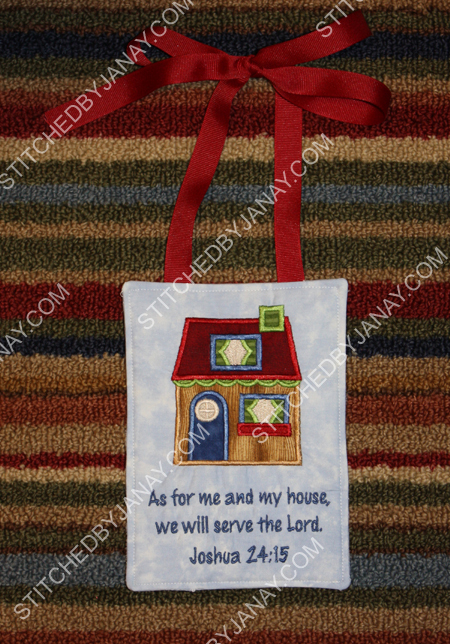 That's another reason I LOVE Lynnie Pinnie designs -- her wide satin stitches make it possible to reduce appliques for fun projects like this. Ok, so becoming a fan of Whimsical Fabrics on Facebook has been a pretty good decision on my part. 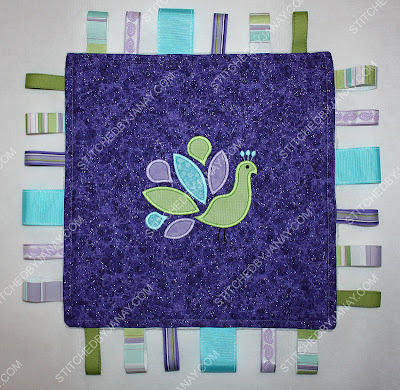 I've won some beautiful fabric, some adorable lettuce edge shirts, and there's one more thing -- a coupon code for 5% off purchases... AND I get to share the code with YOU! Can you believe it? 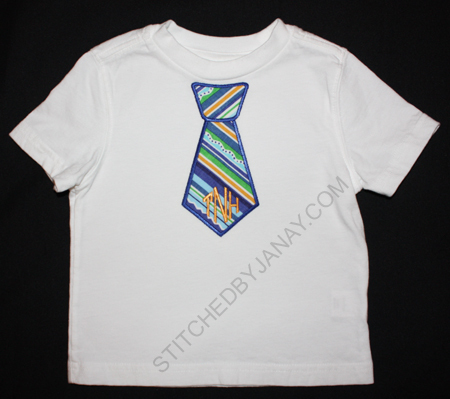 So if you need any Riley Blake Fabrics or cute little blank shirts, head to Whimsical Designs and before you check out, use the following code: JANAY611. It's good on your entire purchase (gift cards excluded) and you can use it multiple times. 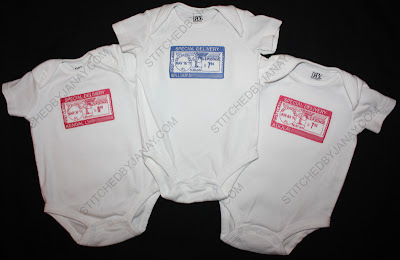 BONUS -- the tees are 15% off through June 15, and you can use the coupon code on top of that! 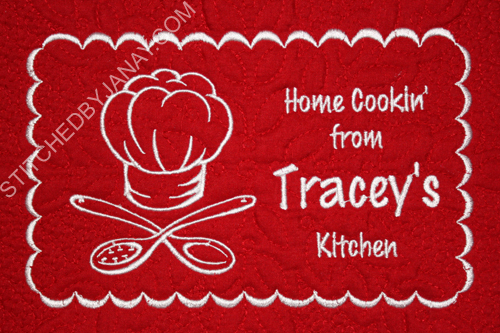 New one-time use coupon code, valid through September 2011: JANAY911. I purchased this cover-up last fall on clearance, so I've had it for a while. BUT of course I wait until the morning of Annaliese's first swim lesson to actually put something on it! :) After perusing all the fun beach designs I have, we decided to do a pair of flip flops. 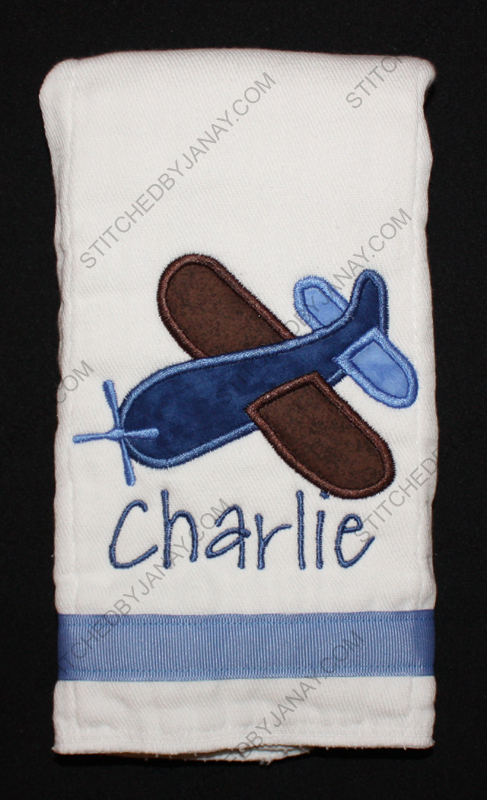 I used Embroidery Boutique's Flip Flops Applique design. 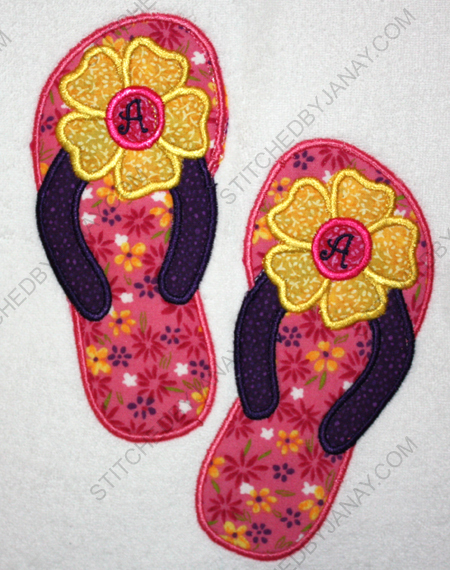 Since Annaliese has a pair of monogrammed flower flip flops, we decided to add a flower to them as well. 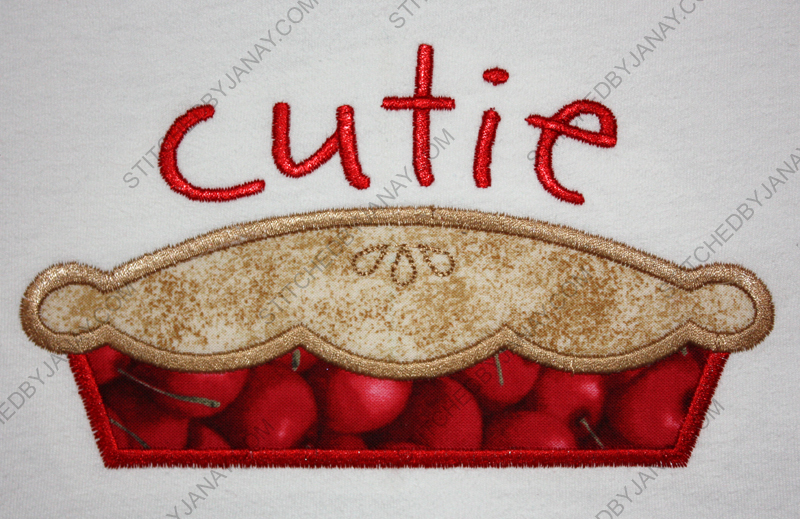 I used the blossom off of EB's free Flower Applique design, and added the A with Embird alphabet #17. The dinosaur applique designs is from Lynnie Pinnie. 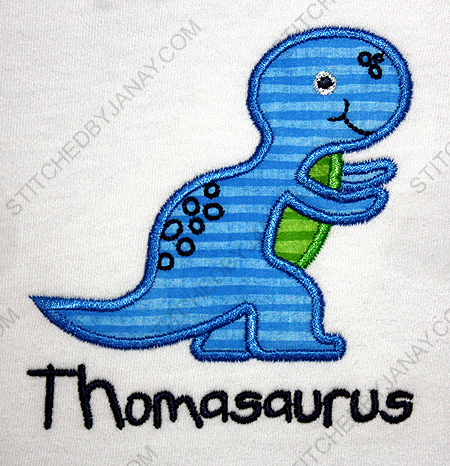 I added "Thomasaurus" with Embird Alphabet #18.